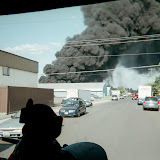 NARRATIVE: On Friday, March 30, 2007 at 2:33 AM, 8 Companies of Spokane Firefighters, 6 Engines, 1 Heavy Rescue, 2 Ladders under the direction of Battalion Chief Craig Cornelius responded to a commercial structure fire at 10101 North Nevada in the Golds Gym Complex. First arriving Firefighters were initially dispatched to an automatic alarm at the address. When the first company arrived they encountered a multiple story office/gym complex with a working fire on the second floor of the Essence Spa. The alarm was immediately upgraded to include the resources mentioned. After forcing entry on several security doors, crews stretched multiple handlines and were able to access the burning structure and begin an aggressive attack on the fire. Positive pressure ventilation and the removal of windows was necessary to remove heat and products of combustion from upper floors and the large space on the first floor. It took 30 Firefighters just 30 minutes to knock down the fire and control the incident. Firefighters were able to limit the spead of fire from the unit of origin and prevent additional damage to the adjoining buildings. No civilians or firefighters were injured as a result of the incident. PROBABLE CAUSE: The cause of this incident is under investigation by the Spokane Fire Department. Investigators are on-scene conducting interviews and examining physical evidence. DAMAGE EXTENT: At the time of this release, firefighting efforts have ceased, however companies will be on scene most of the afternoon performing salvage, overhaul and assisting the Fire Investigators. Damage to the second and first floor of the Essence Spa is considerable. A damage assessment is expected this afternoon and we will follow up with that information as it becomes available. INCIDENT ADDRESS: 1412 West Cora CT. NARRATIVE: On the evening of March 24th 2007 at 23:50 hrs the City of Spokane Fire Department responded to 1412 West Cora Ct. for a reported house fire. The first Engine company arrived at 23:55 hrs and was met by the tenant who said that the fire was out. Upon further investigation the engine officer found flames showing in the kitchen. An attack lead was advanced and the fire was extinguished. A search showed that no one else was in the residence. The fire was caused by an unattended pan of grease on the stove. The tenant was awakened by his neighbor who used a fire extinguisher to subdue the flames, at this time everyone evacuated the Duplex. There was a working smoke alarm activated at the time the Fire Department arrived. The fire was confined to the kitchen and smoke damage troughout the main floor. No injuries were reported. Eighteen Firefighters and two command personnel responded to this alarm.